Tapestry in the Trades Free School made by one of the pupils. 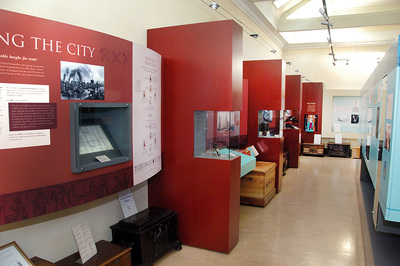 The Craftsmans' Gallery was added to the Trades House in 1808 above the Saloon. It now consists of a corridor and museum. To see the photographs in the corridor, please click here. 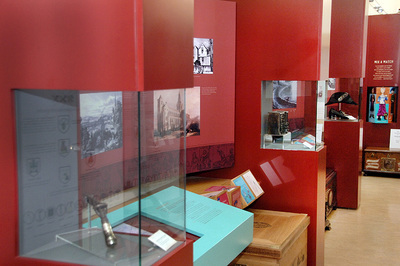 The Craftsmans' Gallery was originally planned as purpose built schoolroom when the Trades House established its own school called the Trades Free School in 1806. When the school was first opened sixty boys took their places, sitting on oak benches. 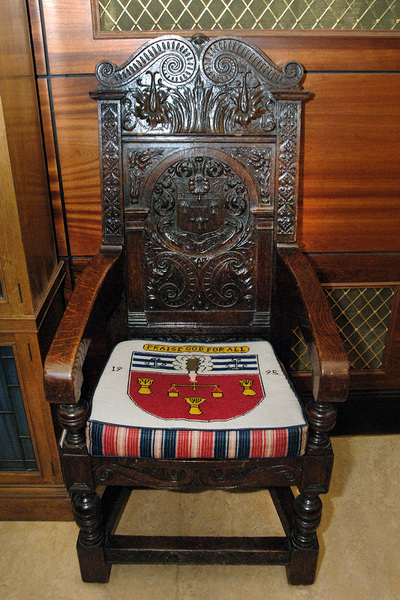 Initially the school was only for boys, the sons of freemen, but in 1838 girls were admitted. 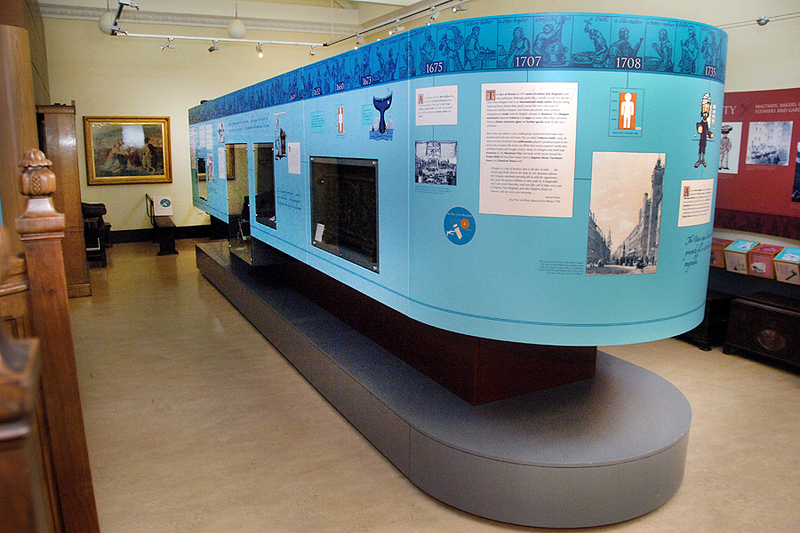 By 1844, 216 pupils attended the school, half of them boys and half girls. During their four years they were taught reading, writing, arithmetic, geography, church music and the principles of religion. A female teacher taught the girls needlework and knitting. 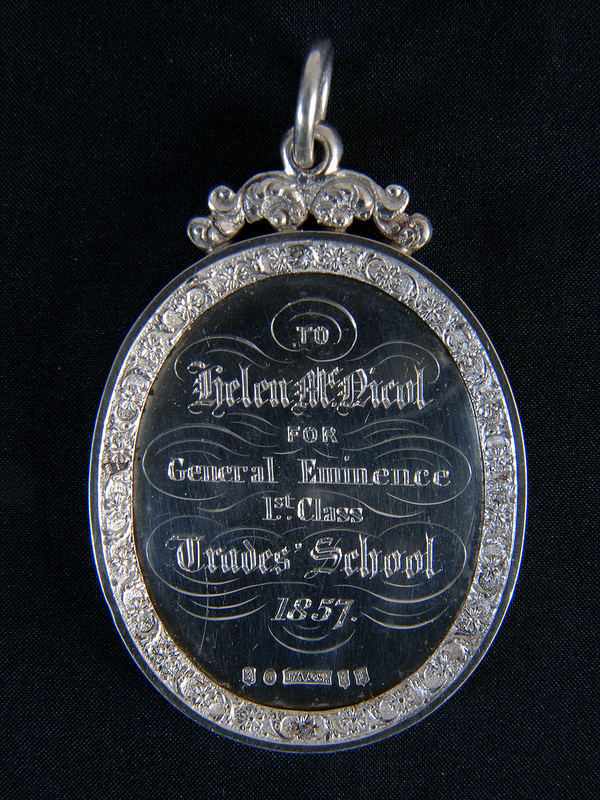 Silver Medal presented to Helen McNicol for General Eminence in the Trades Free School 1857. 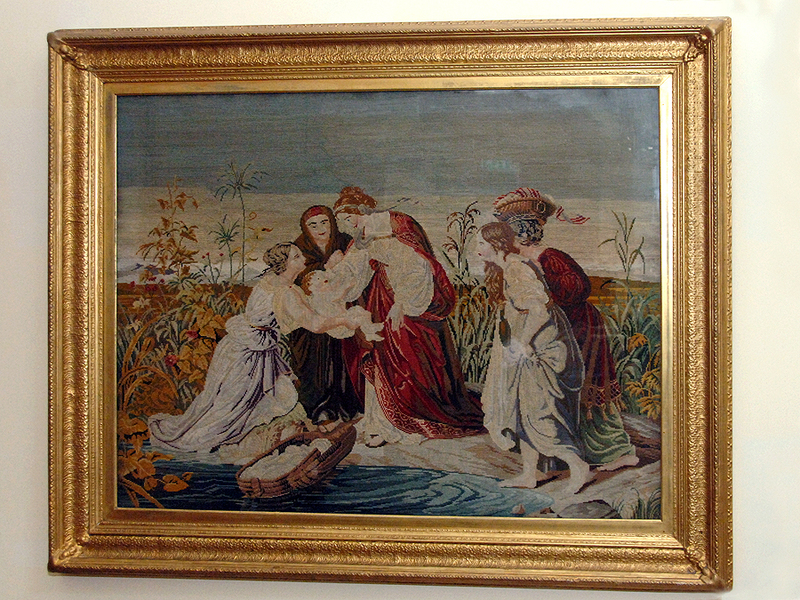 The tapestry the Finding of Moses , above, was made by one of the pupils and won the Trades School prize. 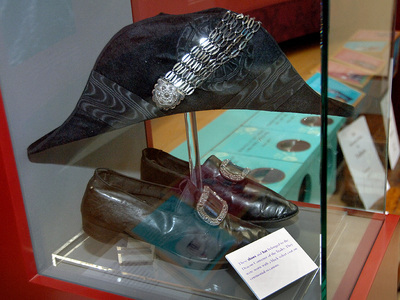 These prizes were often silver medals. The image to the rights shows the medal presented to Helen McNicol for General Eminence in 1857. Pupils sat four exams each year; those who failed to make the grade in spelling and reading were given extra tuition by the female teacher to them up to scratch. Literature was considered very important and the school had its own library housed in large bookcases in the schoolroom. During one session the pupils borrowed over 1600 books. 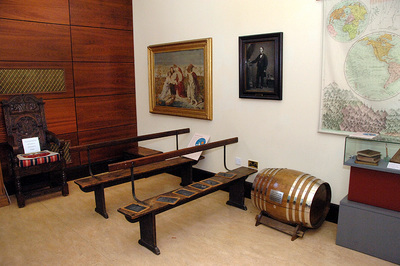 Thomas Struthers, Headmaster of the Trades Free School, from 1845 to 1866. 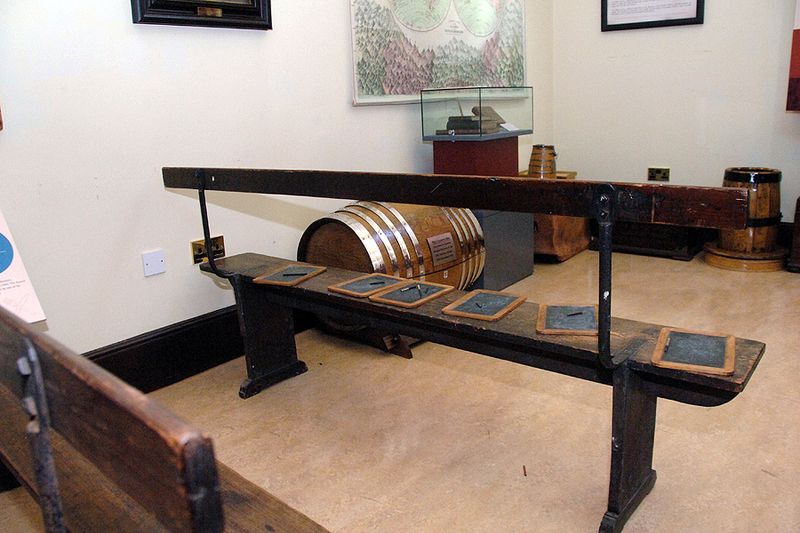 To help pay the staff costs, each of the Trades contributed fifteen shillings a year towards each pupil it sent. By 1839 the school had two male teachers who earned £100 per year, and one female teacher, in the days before equal pay, who earned only half that amount. 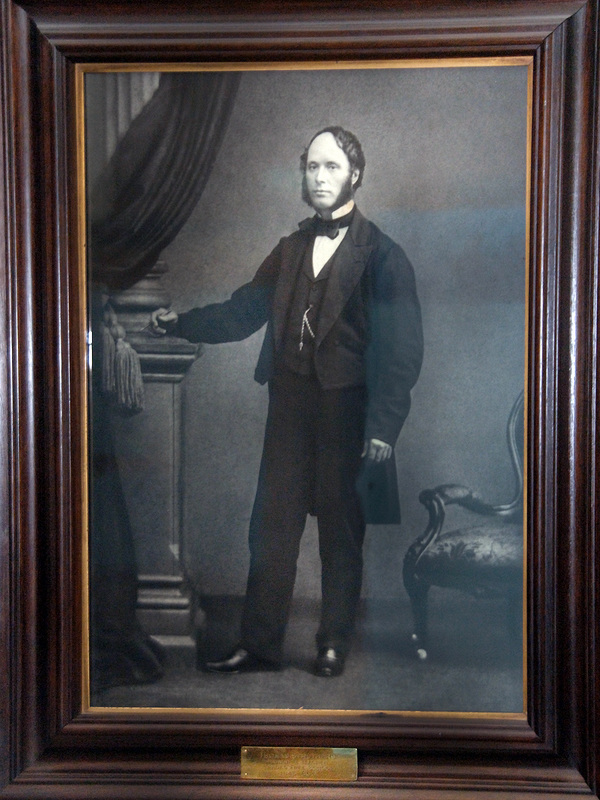 The school principal from 1845 to 1866 was Thomas Struthers and his photograph still adorns the wall of the old schoolroom. 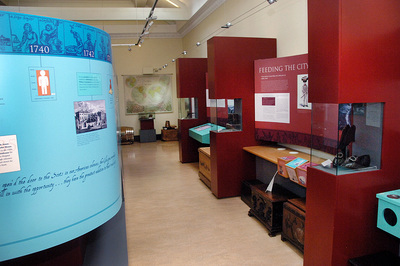 The photographs below show the museum as it is today..